The Dynax 7 Digital/Maxxum 7 Digital is also equipped with the same technically sophisticated and highly effective CCD Shift-type Anti-Shake function, which has earned an excellent reputation in the DiMAGE A1 (SLR- type digital camera with built-in lens). As the Anti-Shake function is built into the camera body and not the lens, it is effective for the entire range of Minolta AF lenses. Thanks to the intuitive control layout being carried over from the three-time international award winning and popular 35mm film AF SLR camera Dynax 7/Maxxum 7, the Dynax 7 Digital/Maxxum 7 Digital is both a user-friendly and compatible design for 35mm film SLR camera users, enabling a smooth shift over to digital. Utilizing an APS-C sized 6 Megapixel CCD and advanced image processing technology, the resulting exquisite detail from highlights to shadows will satisfy even the most demanding photographers. 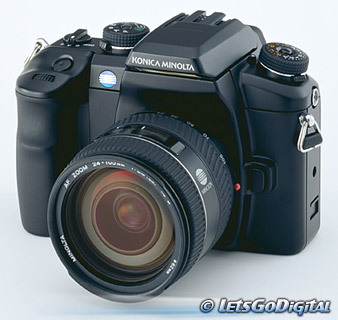 Konica Minolta is committed to develop additional digital SLR camera bodies, more interchangeable lenses, and other accessories to grow with both users' needs and the progress of technology.